Let the Whimsical Sheep on these wonderful mugs greet you when you are having your morning coffee or tea. Hand-made and Hand-painted they will quickly become your favorite mug, always reminding you of the animal that means so much to knitters, weavers and spinners. 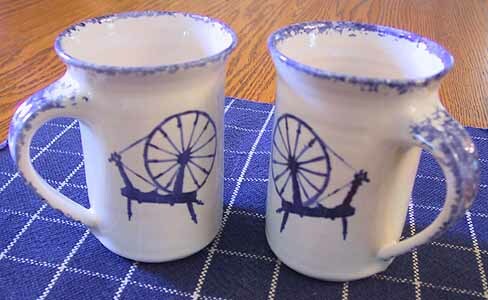 NEW We now have a new Spinning Wheel mug design available as shown below! The beautiful "Walking Wheel is shown on both sides of the mug and is the perfect gift for any Spinner! Each mug is 4 inches tall, 3 inches in diameter and is dishwasher safe. These make great gifts for anyone who works with wool or sheep!